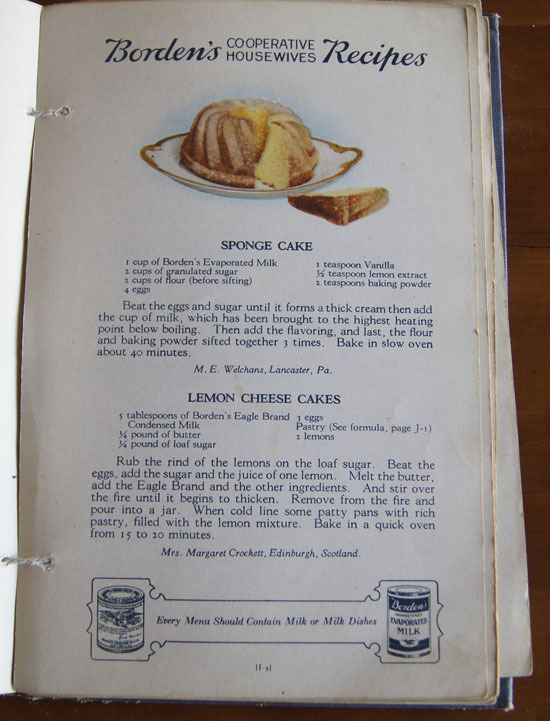 Cookbook #196: Borden’s Cooperative Housewives Recipes, Borden’s Cooperative, NY, circa 1925. As you can see, the pages are held in with a string tie. 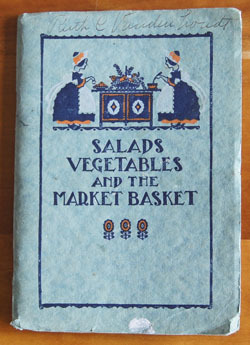 The front of each double-sided page is headed with “Borden’s Cooperative Housewives Recipes” and a color illustration. 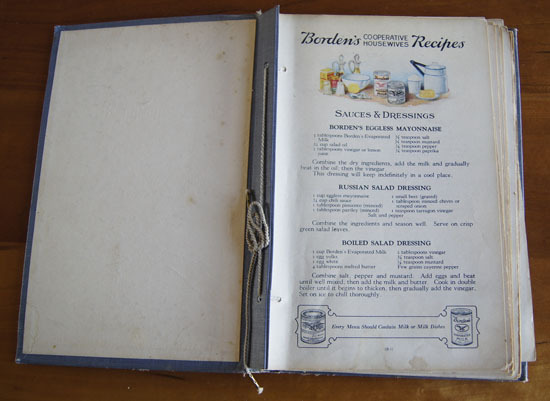 Several recipes follow, and then the bottom of the page has a can of Borden condensed milk on the left, a can of Borden’s evaporated milk on the left, and a saying, like “Every Menu Should Contain Milk or Milk Dishes”. Note the white with blue trim double boiler in the illlustration? To this day, I have one of these vintage double boilers on a shelf in my basement. Maybe the mailing address was simply “The Borden Company, New York, N. Y.”? I am pretty sure this book belonged to my maternal grandmother – she would have been a young mother at the time. There is some handwriting on the back page of the book that looks like hers. So I am almost positive it was her fingers that tied the bow in the string that keeps these pages together. I remember that she could tie perfect bows and that she made her own hats. Mother and I could never tie a good bow. I deduce that Grandma belonged to a “Recipe Club” sponsored by the Borden Company. Probably the company sent her pages on a regular basis, and she would add each page to the book. The pages are numbered with a letter and number, like “B-1”, “E-3”, “G-2”, etc. Copyright: Permission is granted from the copyright owner/holder. 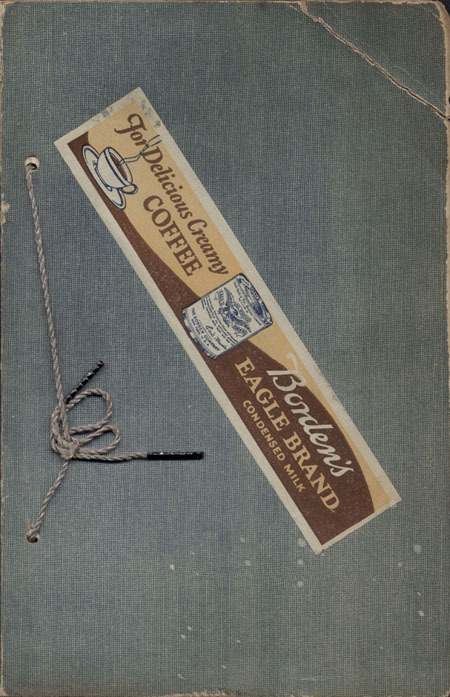 The sticker on the MSU copy reads, “For delicious creamy coffee: Borden’s Eagle Brand Condensed Milk.” Perhaps the sticker on my copy fell off? The book at MSU is part of the The Alan and Shirley Brocker Sliker Collection, housed with the library’s special collections. And, the entire book is available digitally on their website. 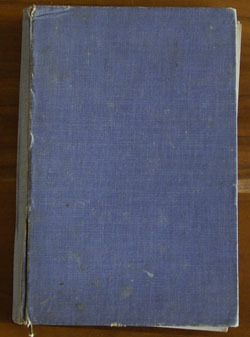 Copyright permission is granted, so I feel free to share with you photos and scans of this very old book. I find one more internet entry pertinent to my Borden’s Cooperative Housewives Recipes on the etsy.com site. 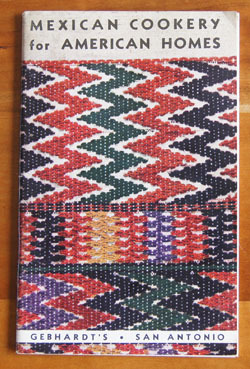 A copy of a book that looks like mine was sold through the etsy site – they have photos of the cover and some of the pages. 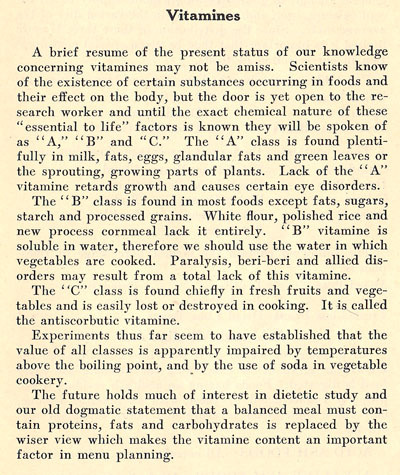 The description reads: “Way back when, Borden’s Evaporated Milk sponsored a recipe club. Each member received recipe installments, and these pages were inserted into a string binding by the Housewife”. They list the publication date as “circa 1920’s”. The pages in my book are in a different order than in either of the copies I viewed online (not surprising) but some are the same. Gail Borden founded the Borden Company to produce evaporated milk in 1857. The company prospered during the Civil War by selling condensed milk to Union armies. 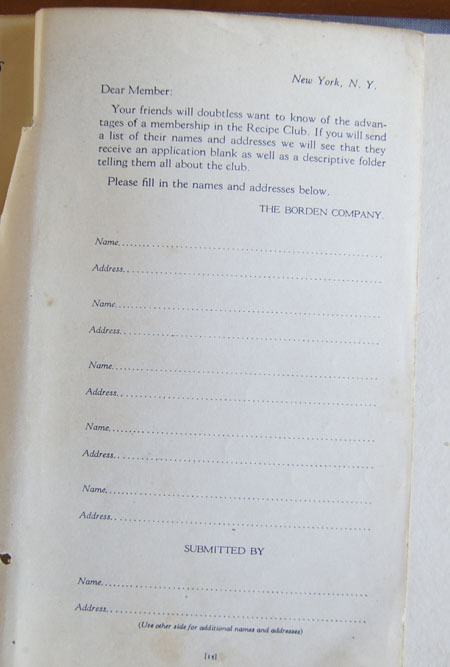 In 1899, the name changed to the Borden Condensed Milk Company, and it became the Borden Company in 1919. It prospered for decades until it suffered significant losses in 1991-1993. In 1997, employees of Borden’s formed “Eagle Family Foods Inc.”, producing Eagle Brand Sweetened Condensed Milk (now a division of Smucker’s). The brand has been bought and sold several times by this point in time (2017). Canned evaporated milk was introduced to the American public in 1853 by Gail Borden. The wikipedia version of the story says that on a return trip from England, Borden was devastated by the deaths of several children who drank poor milk from shipboard cows. At that time, fresh milk could only be stored for a few hours before it spoiled – I think that’s why the cows were onboard. Anyway, Borden was inspired to find a way to store milk for long periods at room temperature. He applied a vacuum to fresh milk to pull off a lot of the water, leaving what he called “evaporated milk”. How did he do this, this chemist asks? A “vacuum” is produced when the atmosphere (air) is removed from a sealed chamber. A vacuum chamber has a lower atmospheric pressure – and at lower pressure, a liquid boils at a lower temperature. In the case of milk, lowering the boiling point of the liquid (mostly water) causes the water to depart the system and leaves the other components of the milk unscathed (because they are not exposed to high temperature). (Rember the old PV=nRT equation you learned in school, where P is pressure and T is temperature? Lower the pressure, lower the boiling temperature. Note that in a pressure cooker the opposite happens: the pressure in increased, and the water boils at a higher temperature.) “Evaporated milk” is stable at room temperature, and when canned will last a long time on a pantry shelf. How was the vacuum produced in 1857? On wikipedia, I find that methods for producing a vacuum in a chamber were discovered by the 13th century. By the 1800s, several types of vacuum pumps were in use. Borden was impressed and inspired by the vacuum method used by the Shakers to remove water from fruit juices. Likely it was a mechanical pump like the first photo on this page, but I could not find out for sure. 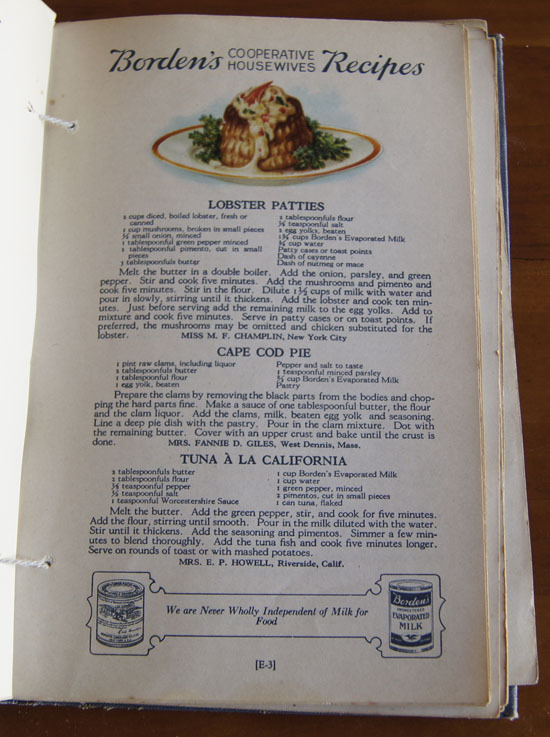 Each recipe in Borden’s Cooperative Housewives Recipes has evaporated or condensed milk as an ingredient. 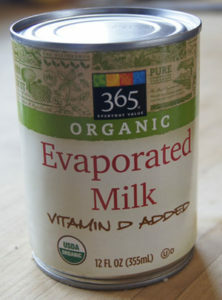 I know that “evaporated” milk is still sold as “evaporated milk” in a can so labeled. But what is “condensed” milk in today’s lingo? I know that “sweetened condensed milk”, a sugar-sweetened form of evaporated milk, is readily available, but is it the same as “condensed milk”? I need to know this before I cook a recipe calling for this ingredient in Borden’s Cooperative Housewives Recipes. I go to Wikipedia and look up “condensed milk”. The entry states: “the two terms ‘condensed milk’ and ‘sweetened condensed milk’ are often used synonymously today.” My question is answered. I do want to note that canned evaporated milk is still often used in cooking, in spite of the readily available fresh milks of today. In some recipes, it works better than fresh milk. I’ve tried fresh milk in pumpkin pie and the pies do not bake up as well as when made with evaporated milk. According to allrecipes.com, canned milk is “the cornerstone of many puddings, including flan, frosting and fudge. Pumpkin pie wouldn’t exist without it”. Canned sweetened condensed milk is a very thick, sweet product that lasts for years in my pantry and I keep it on hand for decadent desserts. Okay, I feel read to cook a recipe from this book! I decide to try “Sponge Cake”. 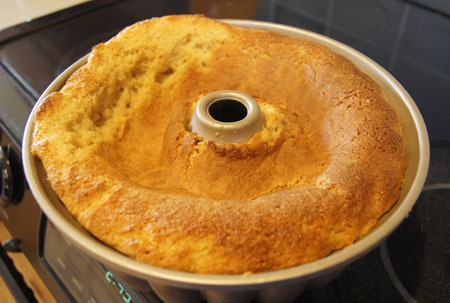 The photo of this cake (one of the photos earlier in this blog) show that it was baked in a bundt pan. I decide not to heat the evaporated milk to just below boiling (this is an unusual step in cake-baking). I guessed a slow oven to be 350˚ F.
I was so disappointed! This is my planned dessert, and we had company. I showed it to my husband and he sympathized with me. Then I waited 10 minutes for the cake to cool. I inverted it onto a cooling rack and carefully urged it out of the pan. Lo and behold! Why did the cake fall? I suspect the oven temperature. After the fact, I found from Wikipedia that a “slow oven” is 300-325˚ F. Or maybe the step that I skipped – heating the evaporated milk – is important for the outcome of the cake. I served slices of this cake with sliced, lightly sugared strawberries and whipped cream. I thought the “crumb” of this cake was a little dense, but everyone else simply loved this dessert! 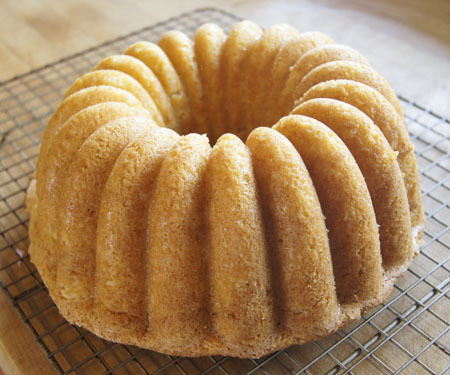 If I try a sponge cake again, though, I will compare and contrast with modern recipes for this type of cake. 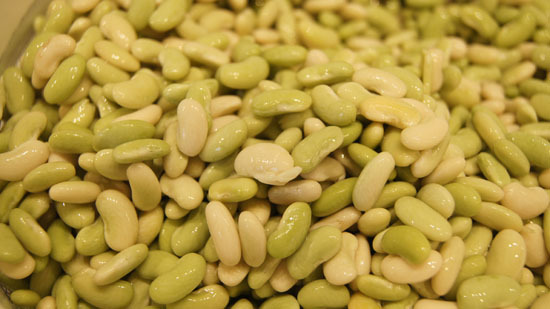 I found an (expensive) bag of heirloom flageolet beans at a little store called “Cured“. Aren’t they pretty? Some of them are creamy tan, and some pale green. 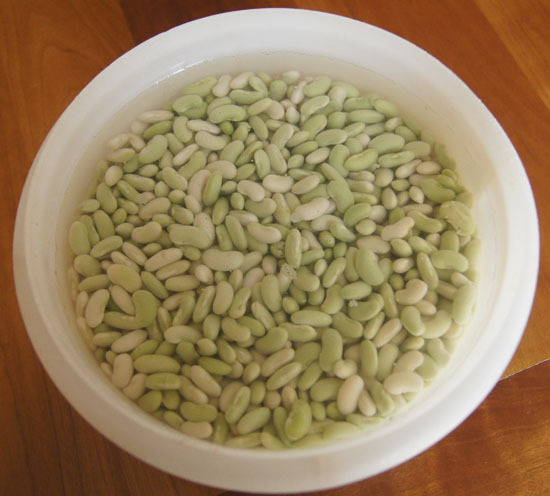 What to do with these flageolet beans? I went to the website of Rancho Gordo, the company that sells these beans. According to Rancho Gordo, If soaked overnight, flageolets need only about 45 minutes to cook. That’s not long, so I decide not to use the electric pressure cooker that I traditionally use for beans, and instead just let these simmer on the stove top. I did add a little salt before cooking, although the Rancho Gordo website advised against it. The cooking liquid from these beans has amazing flavor. I pretty much followed the recipe for Grilled Shrimp with White Beans, Sausage & Arugula on the Rancho Gordo website. I added a bit of basil, and near the end of the cooking I added a couple fresh, peeled, chopped tomatoes marinated in about a tablespoon of balsamic vinegar for about 30 minutes. I served these to my bean-reluctant husband for a Saturday night dinner. Surprise! He liked them! And of course I did! 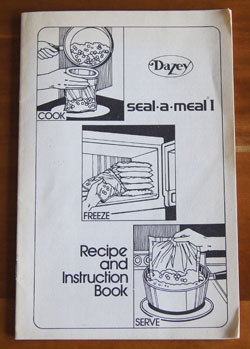 Cookbook #195: Seal-A-Meal I, Recipe and Instruction Book, Dazey Products Company, 1976. I bought a “seal-a-meal” by Dazey sometime way back in the late 1970s or early 1980s. I still have it! And it still works. It’s an inexpensive little unit, with a heating bar and a way to hold and press bags over the bar. Note the two pegs in the above photo, the white one on the left and the black one on the right. Special bags, or “pouches”, were sold that had holes along the side to latch on to the bags. I have a small roll of this type of this bag material – as you can see in the photo below. See the little round hole in the bottom right corner of the photo? I searched and searched, but to my knowledge, this type of bag (with holes along the sides) is no longer sold. The Seal-a-Meal® brand now owned by Sunbeam Products (doing business as Jarden Consumer Solutions). 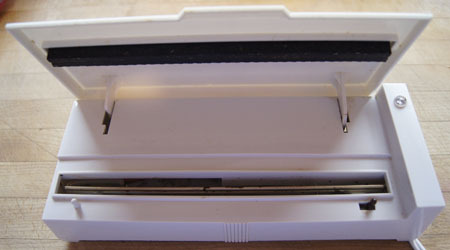 The bag sealer units of today use vacuum to remove the air from the bag filled with food, and then heat seal them. 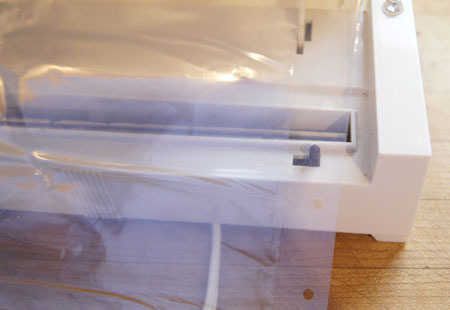 Both approaches result in an air-tight, sealed bag, a bag that can be put in a freezer or in boiling water. There are zillions of reasons to have food or other things in an air-tight bag, or pouch. “Ideas, ideas, ideas” on pages 12-15 of Seal-A-Meal I suggest pouch-sealing food such as tomatoes, vegetables, fruits, eggs, dough for rolls, coffee, even sandwiches. Sportsmen can seal survival kits and fishing gear. Mothers of babies and toddlers can freeze formula and baby foods, and put anything that children shouldn’t touch in seal-a-meal bags. Picknickers can mix up martinis, seal in pouches, and put in the cooler. Seamstresses can store delicate laces and sequins. Teenagers can make water pillows. One can store polished silver in sealed bags. 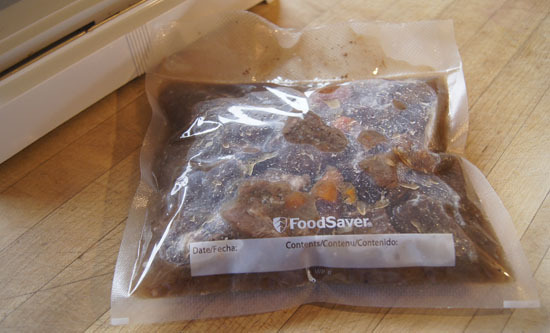 I contribute this idea: buy meat or fish on sale and seal in the seal-a-meal then freeze; this prevents freezer burn. How have I used my seal-a-meal? Mostly for short backpacking or car camping trips. I’d make a batch of chile or spaghetti sauce, pouch-seal and freeze it. The meal would go into one of the adult backpacks, while we watched our kids scamper up the trail. The frozen meal acted like an ice block to keep items like cheese cool in the pack. After we reached our campground and set up camp, we’d heat the pouch of food over a camp stove. 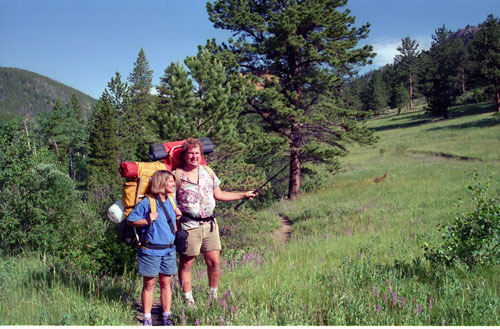 And enjoy a great meal, with the wind blowing softly in the pine trees, the stars coming out over the Rocky Mountains. My Seal-A-Meal I booklet includes a handful of recipes for cooking foods directly in the bag, like poached eggs and or “Fussless Fudge Sauce”. Another handful of recipes are for main dishes like stew, spaghetti sauce, and chile: you prepare ahead (or prepare a double recipe) and freeze in a seal-a-meal bag for later. Cut up a chuck cross rib roast – one or two inch chunks – about 3 or 4 pounds of meat (or use pre-packaged stew meat). Toss away any big chunks of fat. Turn on an electric pressure cooker to “brown”, then add about half the meat. Oil in the pan is optional. I found that the first half of the meat I put in the pan browned well and most of the liquid evaporated – I should have removed it and browned the other half, but I looked at the clock and was running late, so I just tossed in the rest of the meat. In a few minutes, the splattering pile of meat still had a lot of liquid in it, but what the heck, time is ticking. Add a roughly chopped onion and carrot, and maybe 4 chopped garlic cloves. And some salt and pepper. Open a bottle of red wine and pour in a good dollop. Add maybe a cup of water. Cover and seal the pressure cooker, set to “high pressure” for 22 minutes, then let the pressure come down on its own. Well, I let it come down until it was time to leave, when I released the pressure totally and unplugged the unit. I came back maybe 6 hours later. And it was perfect! This made enough cooked stew meat for 3 meals for 2 people. I divided it in thirds, and put one portion in a pan on the stove top. I mushed up the cooked carrots and onions with a fork: they are there just for flavor. I added chopped carrots, celery, and potatoes, more water, and cooked until veggies were done. Then I thickened with a little cornstarch mixed in a bit of water. It was one of the best stews I have ever made! I heated the seal-a-meal unit for 3 minutes, placed the top of the bag on the hot bar, pressed out most of the air, closed the top, and said “one seal-a-meal, two seal-a-meal, three seal-a-meal, four seal-a-meal”, then it was sealed. It sizzled a bit because there was a bit of food in the sealing area, but it still formed an air-tight seal. The filled bags are now in my freezer, ready for a couple quick meals. As I used my seal-a-meal this week, I did find the it to be a good method to seal foods for storage. The frozen pouches take up little space in the freezer (compared to a plastic lidded container). The drawback is the time involved (maybe 5 minutes to find and heat the unit and to fill the bag) and the messiness of filling a bag with a wet food like a stew. Since the advent of seal-a-meal units in the 1970s, plastic bags with nearly air-tight “zip” type seals entered the American marketplace (Hefty and Ziplock brands). Although I wouldn’t freeze something like stew in these bags, I do use them for fresh meats that I’ve bought in bulk; cooked hamburger and sausage; tomatoes, fruits, nuts . . . I use these ziplock-style bags all the time. The advantage over seal-a-meal is that they are quick and easy to fill. Also, I often re-use these bags by rinsing with water. For leftovers like pasta sauce and chile, I use reuseable, lidded solid plastic containers like Tupperware® or Rubbermaid®. Most of my Tupperware is ancient (they don’t make it now as well as they used to!). Recently, Rubbermaid has come out with a line of “easy find lid” containers that I like a lot because many of the lids are interchangeable between container sizes and the lids are easy to find and the containers stackable. I like them too because they are reusable and thus better for the environment. And nerdy me, I keep a list of what’s currently in my freezers in Evernote, accessible from my computer, iPhone, and iPad. I have two freezers, one with the refrigerator and one huge one down in the basement. We are 6 miles from the nearest town, and 20 miles from a big supermarket, and I hate to run out of something and have to drive out to a store. Plus I can take advantage of sales. Plus when I was working, I could cook for a whole week on Sundays and store the meals in the freezer. 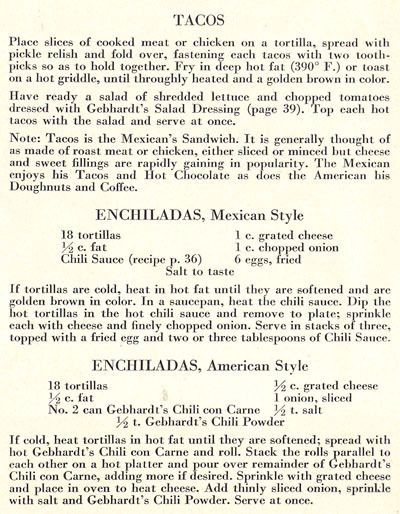 Cookbook #194: Mexican Cookery for American Homes, Gebhardt’s, San Antonio, 1935. I am not sure how I acquired this cookbook, maybe it was Grandmother’s, or maybe it came from the Ruth C. Vandenhoudt house. One recipe – Chili Meat Loaf – has a handwritten note, but I’m not sure whose writing it is. 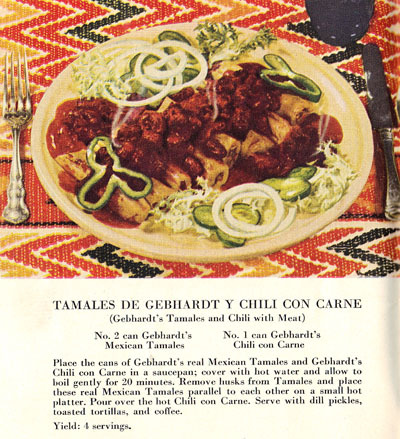 Mexican Cookery for American Homes was produced by the manufacturer of a chile powder: Gebhardt. 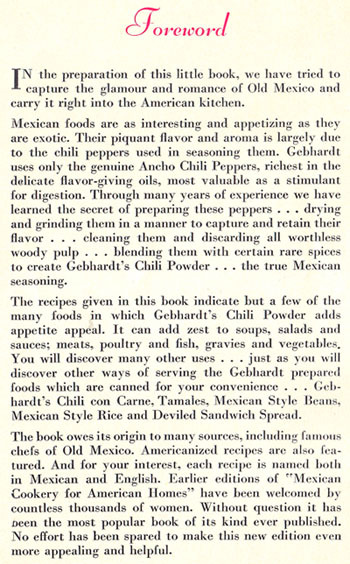 Almost every recipe calls for either Gebhardt’s chili powder or Gebhardt’s canned chili. Yup, you put two cans – unopened – in boiling water for 20 minutes! Silly indeed. I decide to make “Enchiladas, Mexican Style for this blog”. It’s the middle recipe in the scan below – I included the other recipes for curiousity’s sake. 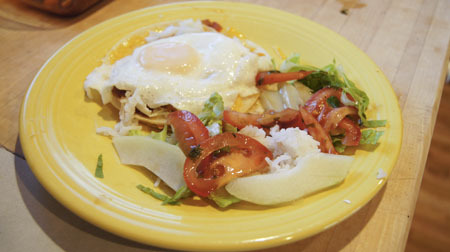 Note that the Mexican style of enchilada is served on flat – not rolled – tortillas. And, you put fried eggs on top. Another twist! I’ve put poached eggs on tortillas and beans to make Huevos Rancheros and we’ve always like them. I’ll make these pretty much as the recipe reads. Except, I do not want to fry the tortillas, instead I’ll soften them in the microwave. I don’t have Gebhardt’s chili powder, but I have some great chili powder from Savory Seasonings. To make the sauce, cook the diced onion, bell pepper, and garlic in a little oil until soft. Combine the flour, chili powder, and salt, then add to the cooked onion mixture and stir until smooth. Slowly stir in the tomatoes and beef stock (or water) and simmer about 20 minutes. On each plate, layer 3 tortillas with a little sauce and cheese between each layer. Microwave on high until the cheese and sauce are bubbly – probably less than a minute. Top with fried egg(s) and serve. I served these enchiladas with a little lettuce, rice, tomatoes in a balsamic vinaigrette, and chayote. (More on chayote below.) This meal was a success! I really enjoyed the mixture of egg, tortillas, cheese and seasonings – a different taste for dinner. Hubby said he’d prefer it with refried beans, more like traditional huevos rancheros. Maybe next time. 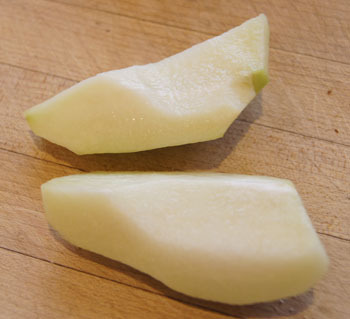 Here’s the sliced, peeled chayote. It tastes like something between an apple and a pear, crunchy and interesting. My tomato vinaigrette is a modification of a recipe for “Spicy Balsamic Tomato Salad” that I found on allrecipes.com. Combine tomatoes and vinegar and seasonings. Let sit, stirring every 15, until flavors combine, about 1 hour. 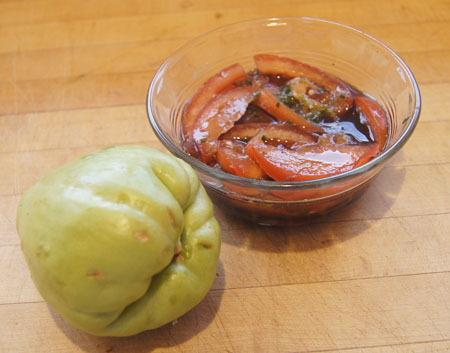 Combine with sliced chayote and serve. 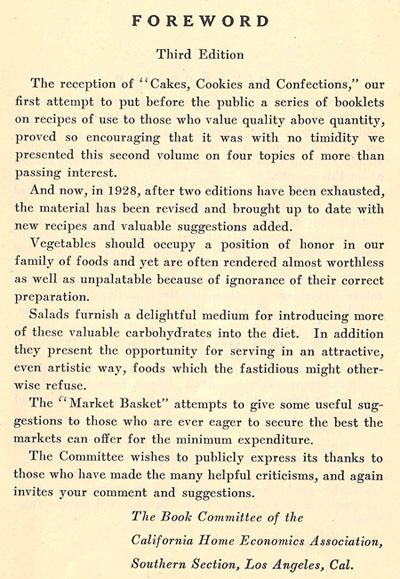 Cookbook #193: Salads, Vegetables and the Market Basket, California Home Economics Association, Southern Section, 3rd ed., 1928. Note:This cookbook is in the same series as Pastries and Desserts, 250 Cookbooks entry number 218. 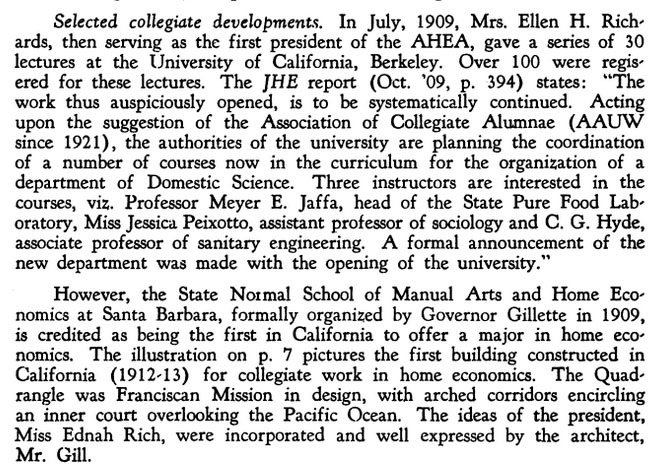 The following is the beginning of an appendix in The California Home Economics Association, yesterday, today, and tomorrow, 1921-1961. 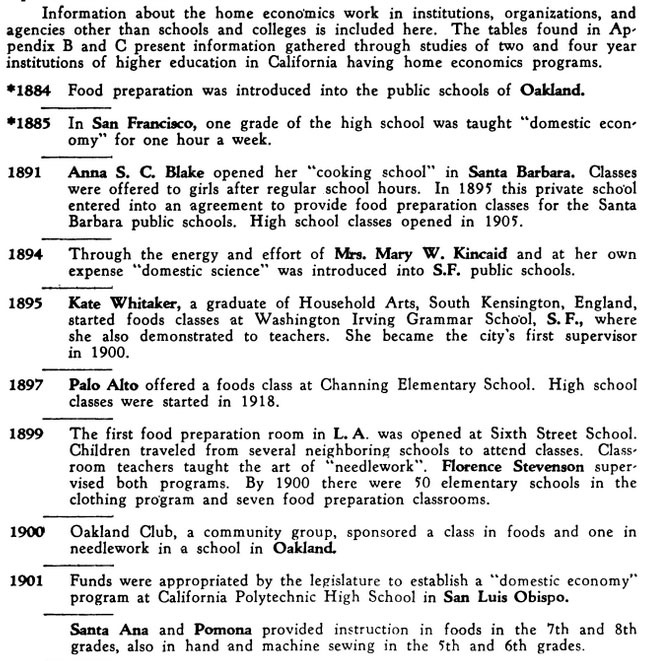 It dilineates the early introduction of home economics to California schools. Note the last entry on “hand and machine sewing”. I learned sewing (as well as cooking) in junior high in California in the 1950s. By the 1960s, American home kitchens are influenced by many changes: industrialization, urbanization, suburbanization, working mothers, a higher level of education, and automation. Salads, Vegetables and the Market Basket in my hands, I stand in my sunny kitchen and feel company with all the women who ever stood in their own kitchens, studying how to get the best food – the best health – for their children and spouses. And yes, I say women. I know that men are also cooks, but in the culture of my youth, the home was the where woman belonged. I am so thankful for my college education, and the chance to break some of womens’ bonds to the kitchen and engage in the scientific pursuit of chemistry, enjoying stretching my intellect, hobnobbing with Nobel laureats, studying in the lab where DNA was first synthesized and isolated, creating new experiments for organic chemistry students, creating web sites, and basically, enjoying the heck out of life. But I always come back to my kitchen for comfort. What shall I cook from this book? The recipes are quite aged. 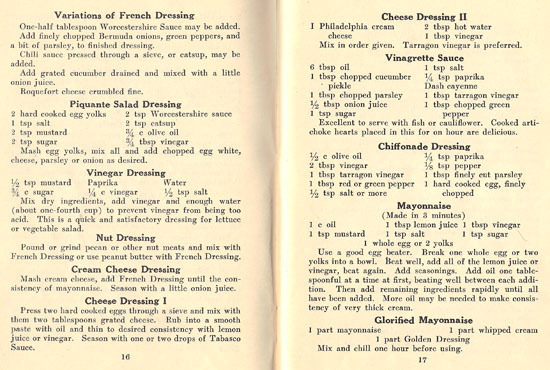 Below are two pages of recipes for salad dressing. They do not include good directions for a true vinaigrette dressing. Cream cheese dressing made with cream cheese and a bit of vinegar does not entice me. 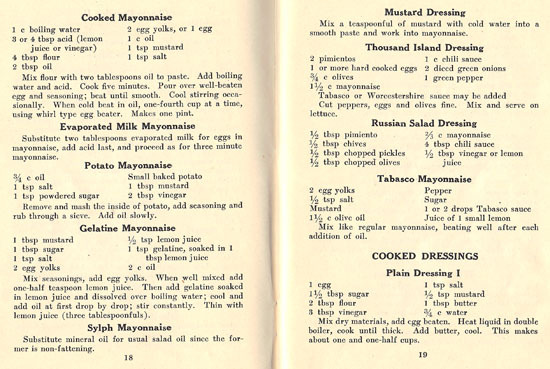 Nor am I inclined to make a piquante salad dressing from cooked eggs, mustard, sugar, worcestershire, catsup, oil and vinegar – or potato, gelatin, and sylph mayonnaises (the last has mineral oil in it instead of vegetable oil). 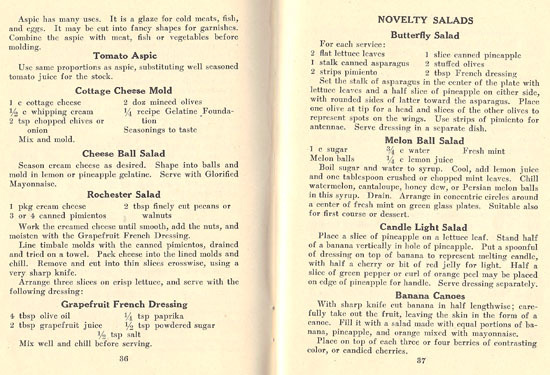 Some salads have fancy presentations, like Butterfly Salad, or Banana Canoes. Salads, Vegetables and the Market Basket includes many recipes for cooked vegetables, from broccoli to to collards to chayote to lentils to potatoes to tomatoes. Many times they are cooked in white or cheese sauces, butter and sugar, or baked covered with buttered bread crumbs. I can’t find anything I want to make! 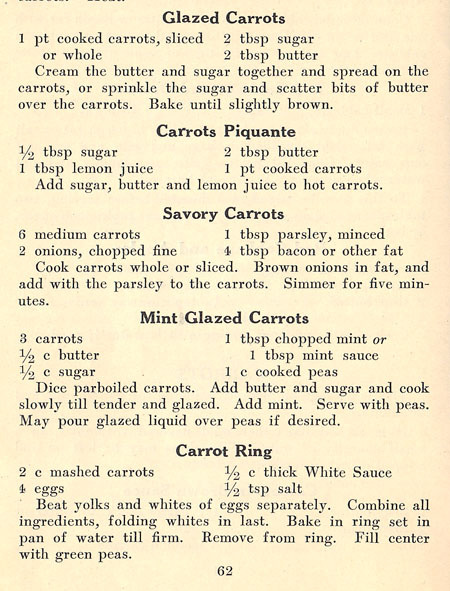 Finally I come upon a recipe for Mint Glazed Carrots (second from the bottom in the scan below). If I cut down on the butter and sugar, these might be a good accompaniment for a meat and potatoes meal. 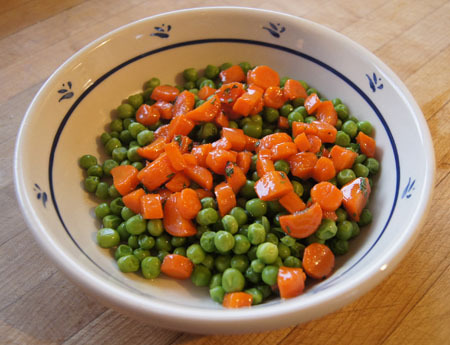 Parboil the carrots: put in boiling, salted water, then simmer 10-15 minutes, just until barely fork tender. Dice the parboiled carrots. Melt the butter in a pan and add the sugar, stir until incorporated. Using medium heat, cook and stir until the carrots are tender and glazed (they do not need to brown). Add the mint. I thought these were good – hubby was less impressed. I love the colors and the bright mint flavor. Yes, they were a bit sweet, but I thought it nice for a change. This name is handwritten on the cover of my copy of Salads, Vegetables and the Market Basket. This tells me that I acquired this cookbook from the Ruth Vandenhoudt house, back when I was a teen. My paternal grandmother was related to Ruth Vandenhoudt, and on Ruth’s passing, relatives were invited to her house to take things from the estate. I found books and books and books – old books with brittle pages and faded covers. A couple were gorgeous, most were just curious and aged. I still have many of these books.